The children and I were watching a Little House on the Prairie episode the other day, and I noticed that the teacher was reading from a magazine, or what would look more like a newsletter or newspaper today. It was called the Young Ladies Journal. I thought I'd look it up on the internet to see if I could find anything. Thankfully, I did! 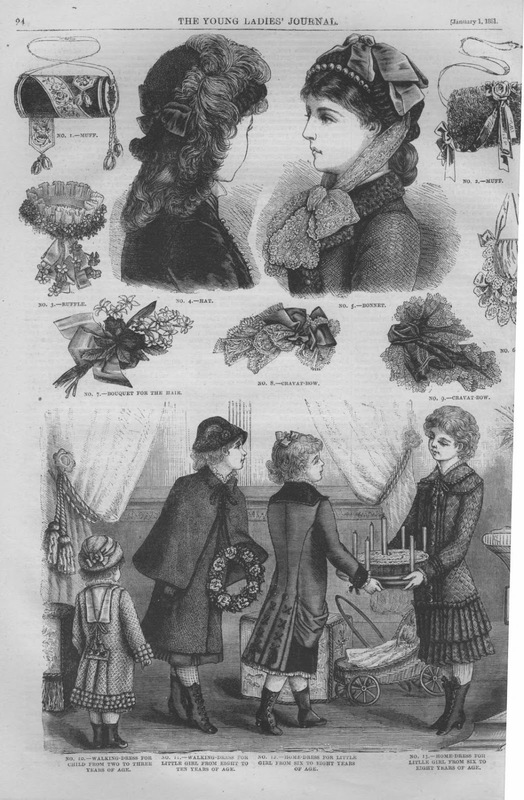 I found some pages from the Young Ladies Journal 1881 [fashion and fancy-work pages], which you can look at on the computer or download to keep. There are recipes, clothing descriptions, short stories, articles of advice, poems, and lovely, lovely illustrations. I will be looking for more and will tell you if I find any more online copies. Please let me know also if you find any. That was very interesting! Thank you for posting it-- I like to look at these old magazines, and own a few old issues of "Ladies' Home Journal" from the 1880's to 1900's plus a "Youths Companion" (the magazine often mentioned in Little House books). I hope to scan them in someday and share. It might be nice to re-print some of those articles, quips and quotes in future posts. How neat that you own some of those! I do hope you can scan them some time. I was thinking along the same lines--that it would be neat to re-print some of the content from the Journal in future posts. Very fun to look at! Thank you for the link!